For a long while now, I have been imaginatively obsessed with things that I saw in the National Museum of Denmark: mummified and eerily well-preserved remains of young women buried in oak log coffins and thrown into peat bogs; meticulously and gorgeously crafted bronze lurs, used for a single ceremonial occasion and then thrown into peat bogs; religious artifacts in the form of sun-dieties pulled by a horse and then thrown into peat bogs, recovered over two millennia later. The notion that’s been aesthetically and otherwise all-consuming for me in this is that no one really knows why these things got thrown into those bogs. From what can be surmised from the kinds of objects found in them and the condition that they were found in, it appears that only the most precious, the most highly-crafted and prized, are the things that were meant and fit to throw into the bogs. The idea fascinates: that those who are most beautiful and precious to us and passed from the world too soon, or the most beautiful object a master craftsman has made or will ever make: it is only these rare things that by the very virtue of their preciousness were not meant or fit for human consumption. These are gifts given (and in the cases of beautiful women, sometimes taken by) to the gods. And the quickest method of delivery back in the days of Nordic myth was to throw whatever was most precious and valuable to you into the bog. This series was photographed in a sinkhole that was used for thousands of years by an ancient culture for human sacrifice. Today, the deep water is used by thousands of tourists on holiday, for recreational swim. The contradiction of purposes is a bizarre and curious one. The swimmers seem oblivious to the history of the location although the darkness and depth of the water allude to another time and agenda. Fleischer’s images connote the unsettling disparity of place, use and history of this location very effectively. While we know at first glance that these are individuals idly and happily dog-paddling or back-floating in what seem to be serene waters, there is still this pervasive sense that something unfathomably dark and complex—unquantifiable—accompanies them. The waters themselves, Fleischer tells us, are deep, and the fact of their depth is what made them attractive to prehistoric priests practicing human sacrifice. 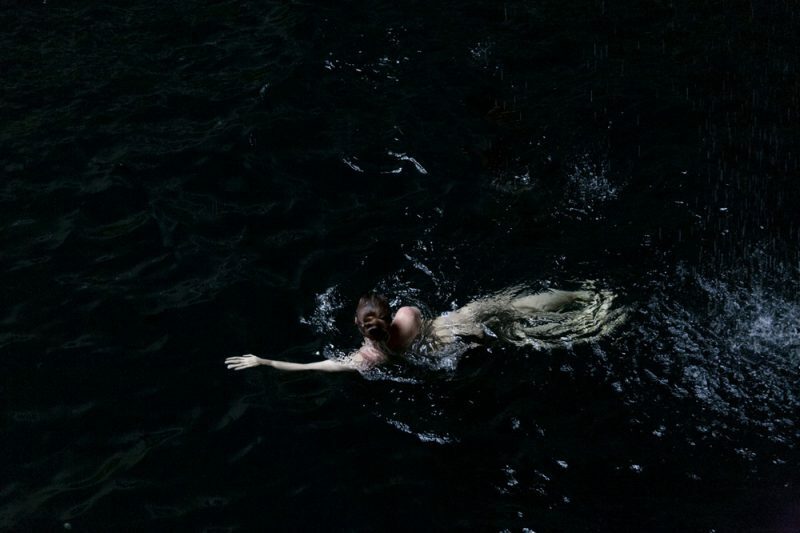 Ominously, deep waters translate as near black in photographs, and the contrasting whiteness of the swimmers’ flesh can be suggestively read as tokens or tributes to a tendriled and terrifying water god. 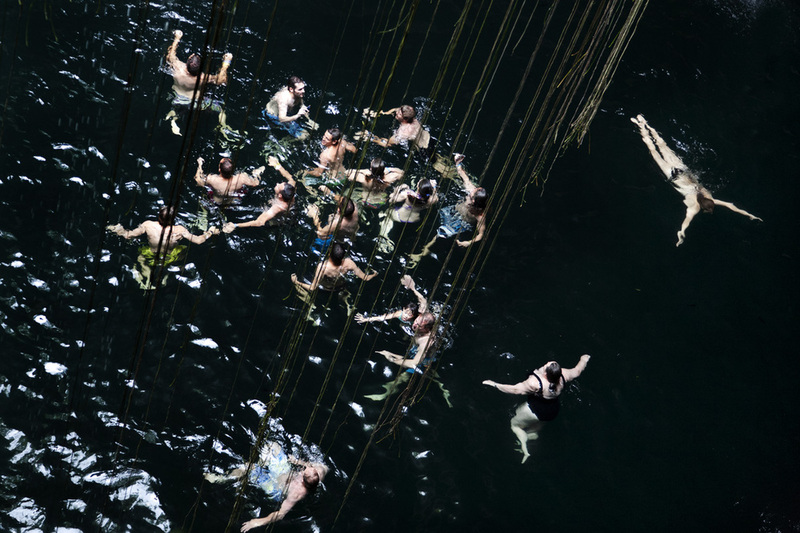 Do these swimmers know the history of their fantastic and exotic swimming hole? Would it matter to their holiday plans if they did? Perhaps like other haunted places, there is a specific kind of thrill-seeking to be found by re-contextualizing and re-purposing sacrificial waters for modern-day vacations. Maybe the two extremes aren’t so divergent after all. Fleischer seems to intimate that oblivion and sacrifice aren’t always such strange bedfellows. In the last couple of years, Fleischer’s series Swim: The Water In Between has been generating a good deal of interest online, in print and in galleries. It has been featured in The Telegraph, Fraction Magazine, Feature Shoot and Harper’s Magazine. A book of the work was published by Utakatado Publishing, in conjunction with an exhibition in Kobe Japan at the Tanto Tempo Gallery in 2014. A very thoughtful review of her installation at Portland’s Blue Sky Gallery can be found online by Richard Speer. Currently images from the series are on display as a part of the CTRL + P show at the Catherine Edelman gallery in Chicago. More images from the series, as well as several other bodies of work deserving of attention, are viewable on Fleischer’s website. Once upon a time, I was a contract writer, pitching stories and writing about contemporary photography for the 20×200 site (and other associated brands). The archives disappeared when the company re-structured and re-launched, and some of the people and projects I wrote about then I believe deserve a longer virtual life. Each Thursday for the near forseeable future I will resurrect one such piece and publish it here. All of these #tbt posts originated on the now defunct Hey, Hot Shot! blog.